As the days shorten and the temperature drops, we often get clear skies full of twinkling stars and a bright, silvery moon. This for me is one of the gifts of Winter. It is interesting that in our non-stop, keep going, going busy, keep doing, doing, doing culture the fiery Sun Salutation is a firm favourite feature of many Yoga classes. And it’s a great sequence to dynamically get the body moving, increasing your energy and dynamism. I love it. However, as in everything we need balance. We need to be able to ‘get up and go’ but we also need to be able to ‘rest and digest’. We need the heat and dynamism of Surya Namaskar to fire up out solar energy and we need the cool and calm of Chandra Namaskar to cultivate our lunar energy. So, when you’re feeling overworked, overheated and overstimulated the moon sequence offers the perfect way to restore peace and relaxation by soothing your emotions and stilling your mind. One of my students came to class this week, having seen how beautiful the fast-approaching full-moon looked, and asked if we could do Chandra Namaskar as part of our practise. I was more than happy to include this beautiful sequence after practising vrksasana, so you could say we gazed at the moon through the beautiful branches of a frost-kissed Winter tree! I find it especially powerful to practice the moon sequence in the evening, slowly and with keen awareness. It’s a lovely sequence to use during times of inner turbulence when you’re emotions are jangled and thoughts are whirring round and round in your mind. The times when sleep can seem elusive because it’s too hard to put these troubling thoughts and feelings to bed. Working with Chandra Namaskara is like pouring sparkling, silver oil on troubled waters. I find visualizing the moon before and during practice also gives added benefit. 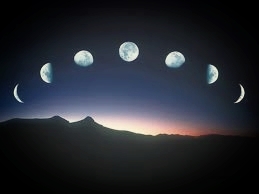 Reflecting on the phases of the moon – waxing and waning in appearance – but in fact being always present in its entirety. And to realise that this is a perfect reminder of the waxing and waning we too experience day to day. That in life we go through emotional and mental waxing and waning (or ‘good’ and ‘bad’ times) but that we were always whole. We could choose to let it remind ourselves that everything – every action, every emotion, every thought – also passes. Moreover, that in order to appreciate the beauty of the light of the full moon we have to also know the empty-sky darkness of the new moon. The moon has so much and so varied symbolism for every culture around the globe, from transition to magic, from romance to immortality. We could take this as yet another reminder of the power and importance of the moon regardless of whether we choose to classify it as female or male. That ‘the’ moon, ‘our’ moon, is just the astrological body that orbits planet Earth. Just as we, at the end of the day, are all people living on this earth regardless of our gender identity. And hopefully we’re all taking time to gaze at the moon and give thanks for its glory.